True American cranberries, Vaccinium macrocarpon, are part of the blueberry family and like similar conditions – acid moist soil and sun. 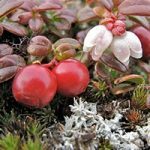 Cranberries are low growing, trailing plants which are easily grown in containers with an acid compost if soil conditions are not suitable. The varieties here are all bred in North America for good fruit production.